Hamster Club :: Horatio's One Wish - A Tale of One Heroic Hedgehog, Two Loyal Hamsters, and a Missing River Otter. 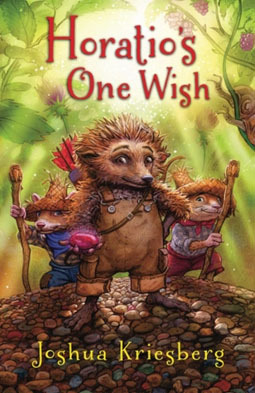 Horatio's One Wish - A Tale of One Heroic Hedgehog, Two Loyal Hamsters, and a Missing River Otter. Joshua Kriesberg, the author of: Horatio's One Wish, sent us this great book for review. Horatio's One Wish is a children's novel but can also appeal to adults. The main character in this novel is a Hedgehog named Horatio. What makes this novel special to us at Hamster-Club is that this novel also stars hamsters! The hamsters in this novel help Horatio the hedgehog in his adventure of a lifetime. This book has the theme of friendship and loyalty which are important in everyone's life. That's what makes this book a great story for all ages. Horatio has lived alone as long as he can remember. His only friend is a river otter named Rollic, who visits him nearly every day. But when Rollic goes missing, Horatio knows he must rescue him before it's too late. With the help of hamster twins, Whisklet and Whimser, Horatio sets off on the adventure of a lifetime. Along the way, Horatio meets Leala, a champion archer from the hedgehog village - a village Horatio never knew existed. Leala opens the door to a home Horatio has yearned for all his life. Will Horatio continue on and risk his life to rescue his friend or will he follow Leala back to his long-lost home? To buy this book, please click here.